Phu Quoc Island belong to Kiên Giang Province, located in the South East Sea of Việt Nam, 120 km east of Rạch Giá and 46km east of Hà Tiên; has eight (8) communes and two (2) towns; population about 103,000 people; natural area of 59,923 hectare, conclude of 27 isles, in that: Phu Quoc Island is the biggest, with the area of 567 km2, circumference coast of 150 km; in the ocean area neighboring with Thailand, Malaysia and Cambodia. Phu Quoc is called the island of "99 mountains" because of its many sandstone chains gradually descending from the north to the south. 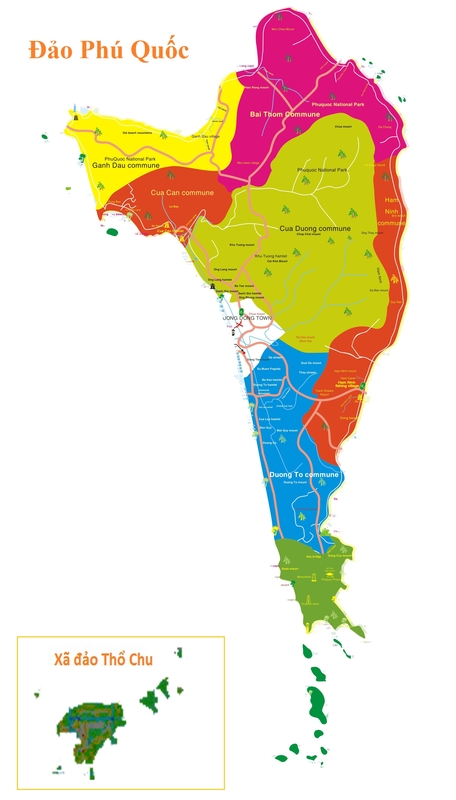 The longest one is Ham Ninh which stretches for 30 km along the eastern edge with its highest peak called Mt. Chua (603m). Phu Quoc has a monsoon sub-equatorial climate. There are two seasons in the year: the rainy season (October only) and the dry season (November to September). The average annual rainfall is 2,879 m and the average temperature is 27oC. Trips to Phu Quoc can be made all year round, but the best time is dry season when the sky is always sunny, clear and blue. Phu Quoc is also called the Emerald Island because of its natural treasures and infinite tourism potential. The island is well known for its high-quality fish sauce; Phu Quoc fish sauce smells particularly good since it is made from a small fish, ca com, with a high level of protein. The island produces 6 million liters of fish sauce every year. 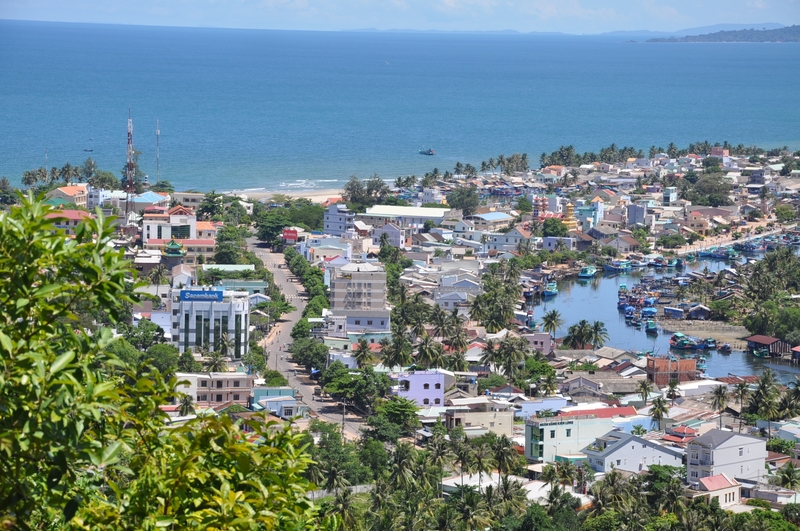 Phu Quoc Island has many harbors such as An Thoi and Hon Thom where international and domestic ships anchor. Also, there are several historical sites on the island: National Hero Nguyen Trung Truc's military base, King Gia Long relics from the time he spent on the island, and Phu Quoc Prison. Off the coast of the island emerges a group of 105 islands of all sizes. Some of them are densely inhabited such as Hon Tre and Kien Hai, 25km from Rach Gia. Visitors can spend time on the beach or hike while observing the wild animals.